Are you squandering your precious book-publishing potential? If you’ve delayed your book in the past, or had some ‘false starts,’ this information is for you! Learn about Gilat’s VIP (Very Important Publisher – that’s YOU!) Book Coaching Program HERE. But with all of the commitments pulling you in different directions, it is easy to become distracted…and put your book project aside (again). What will be different this time? The difference is having an experienced ‘book coach’ at your side, who not only preaches theories, but has BEEN THERE herself. Additional streams of income – if marketed strategically, each book can provide you with a “cottage industry” around it. So in fact, the more (high quality) books you publish, the more “profit centers” you are establishing. Hello, there! 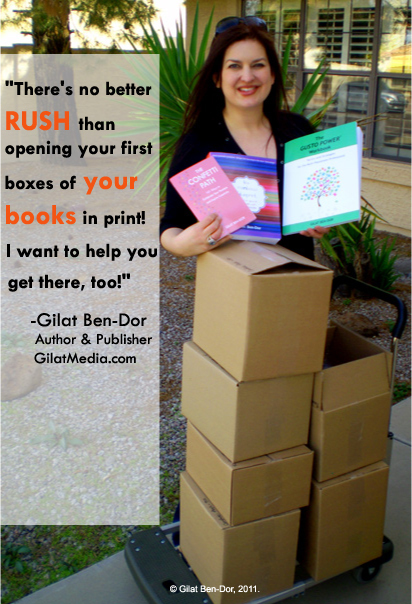 My name is Gilat Ben-Dor, and as a published author of multiple books and a creative marketer and multipreneur, I am passionate about the process of creating these “profit centers” out of my books — and I am equally passionate about helping others to do the same! For a limited time, I am providing this service as a special One-on-One Accelarated Coaching opportunity for a select number of clients. If you are committed to doing what it takes to thrive, and are confident in your ideas and want to take them to the next level through a book, you need to join me, Gilat Ben-Dor, TODAY, in a program that will take you Step-by-Step through the pitfall-laden process of independent publishing. I can promise you that I don’t mess around. I only work with serious, motivated ‘go-getters’ who are ready to move forward with their project. If you’ve tried before and did not get it done, no problem: we will work to figure out what held you back before, and break through those barriers for your success! So what are you waiting for? The more time you waste, the less time you will have to enjoy the rewards of being a business-savvy author!